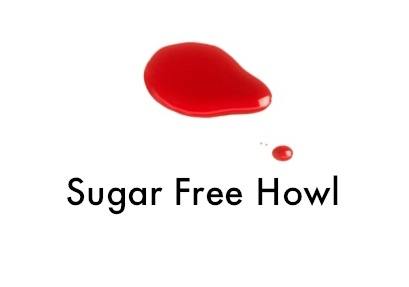 Sugar Free Howl : "Crying helps me slow down and obsess over the weight of life's problems." Ah, the end of the year post. January: the beginning of the end. I was drinking almost every day without control, moderation, or responsibility. My job was in the shitter, and I took an inadvertent hiatus from comedy because of my stress. My hair was falling out and I had next to no fingernails. I had every excuse to drink, although there were numerous times I mentioned to those close to me, "I didn't drink today," indicating I had a problem. I admitted numerous times that I had a drinking problem, but I never accepted it. February: the end of an embarrassing era. I blacked out during the Super Bowl, and ended up throwing up so I could drink more. I ended up having to find out twice that we lost the game. I drank off most of my hangovers, behavior I didn't exhibit through most of my drinking career. Ten days later, I was assaulted on Valentine's Day. After becoming concerned about my injuries and going through withdrawal, I checked myself into urgent care and then the ER. In the ER, I made the hardest phone call I've never had to make: I called my mom and asked for help. I entered inpatient rehab on February 24 after a chemical assessment verified I am an alcoholic. March: early sobriety. My inpatient schedule included two group therapy sessions, three lectures, and three awful meals per day. Because I was eating three meals per day, I gained weight because it was the first time in months I was consuming something other than sunflower seeds and Coors Light. I confronted my demons, the reasons why I drank, and faced the truth that I have an "allergy" to alcohol: while others can tolerate "normal" amounts, my reaction to the substance is incredibly severe. I am discharged from inpatient on March 17. April: outpatient. I attend outpatient rehab two days per week in addition to two AA meetings per week, one of which is still my favorite group. While I was waiting to get checked into inpatient, I approached Squad 6 bruised and afraid. They told me to keep coming back, and I attended their Thursday meeting every week until I moved in late July. I developed a schedule surrounding sobriety, committing time to meetings instead of open mics, and activities that were conducive to a sober lifestyle. May: drifting apart. Hurray for break ups. What should have been ripped off like a bandaid became a delicate, intricate procedure that took place over many weeks. Most nights I spent crying under the covers, avoiding anything and everyone. Isolation is incredibly dangerous for someone in early sobriety, and can be indicative to a relapse, but I rallied. I stayed connected with sober peers and began to entertain the idea that Minneapolis was causing me more pain than I could emotionally tolerate. I started taking myself to a movie every Sunday. It was a date with myself, me time. I didn't consider it isolation if the theatre had a considerable audience. Moving home to Seattle slowly became a more tangible possibility, a safe haven from the possibility of returning to drinking. June: amends. I make my first amends with those I have wronged. I always accompanied pain with alcohol, which lead to others constantly experiencing my unconscious wrath. I began to talk about my experience in sobriety on stage because I am no longer ashamed of my disease. My material developed into something extremely personal, yet educational. In late June, I decide to pull the plug and move home to Seattle. My stress and anxiety was tantamount to any other emotions I was experiencing, and I strongly felt that if I continued to be in a place which threatened my sobriety, I would relapse. My plans are to leave at the end of August, coinciding with the end of my lease. A flight is booked for July 10 to fly out my cat so he doesn't have to spend an unknown amount of days in the car. He likes his new home and my mom takes good care of him. I see "Inside Out" alone and ball my eyes out alone in the theater. July: reoccurring threats. The four horsemen of 2014 reared all of their heads one evening outside Bryant Lake Bowl. Shaking and crying, I screamed all the way home trying not to go to a bar. I hid under the covers and hugged my cat, trying to remind myself that drinking will not solve my problems. I decide to advance my move date to the end of July. A few days later, I push my move date closer to the 27th. While people tug at my heart and make me want to stay, I had to pack it in. I gave most of my belongings away, either on the curb in front of the house or through Facebook. Piles upon piles of clothes were donated. I didn't want to have a going away party. I simply just wanted to leave. Painful goodbyes were exchanged in my kitchen, and minor feelings of regret began to arise. I cried and procrastinated after I packed up my car. I dinked around and smoked a cigarette, wondering if I was really making the right decision. I left for Rapid City that day, and continued onto Bozeman the next. I left Minneapolis on a Monday morning and made it to Seattle Wednesday evening. I am tired, exhausted, and sick. August: deteriorating health. My body was going through medication withdrawal, my blood sugars were high, and my anxiety severe. The first two weeks I am in Seattle were painful and obnoxious. Battling consistent vertigo and nausea, I make it through the month. My smoking becomes less habitual, and I spend most days at the beach to smell the salt water, take selfies, and watch dogs find their ever-loving stick. I introduced myself to the Seattle comedy scene and was welcomed with open arms. People became aware I'm more experienced than others and my schedule starts to pick up steam. September: old feelings and stuff. A lot of feelings I felt in the past began to resurface, like a boiling pot of water conjuring bubbles. Raw and familiar feelings arise, causing some instances of steam here and there. The comfort, communication, and solace I rediscovered moved me to an emotional point. I begin to regret my move, but I maintain focus on sobriety and my recovery efforts. I find a new AA home group in Seattle, in the church where I went to preschool. I am beginning to make friends in the rooms I attend and I no longer feel like a stranger. A trip to Los Angeles manifests both pleasure and anxiety. The pot boils over. October: the "third" step. When you enter AA, three ideas are hammered home over and over: go to meetings, work the steps, and get a sponsor. I was nine months sober before I decided to find a sponsor. She spent the time getting to know me and recovery really started to fall into place for me. I was working the steps as they needed be worked, and not as I felt they should be worked. I am getting through my first football season sober by regularly watching the games at home, usually with a cup of coffee and a happy cat on my lap. Comedy really picked up. I became more established in the scene and I realize I have made more progress in the Seattle comedy scene in the last three months than I had in Minneapolis in the last two years. I won a monthly contest and met new friends. I made travel plans for November to return to Minneapolis for the first time in four months. November: homeostasis. I find my groove and most things are finally right in the jungle. My blood sugars are good, my anxiety lessens, and I establish a pattern of visitation with my other half. I reconvened with an old friend and her new baby, and I find support in my AA family and my comedy family. Thanksgiving and my birthday were considerably rougher than I imagined they would be: my first holidays sober in eight years. I generally hate this time of year, even though some claim I should be grateful. I whiteknuckled through two days of bad cravings and impatience, but I stayed sober. An old colleague from Comcast contacted me and we talk sobriety and our similar struggles. I placed in another comedy contest, and my writing gets better. December: reflection. I think back to this year and realize how much my life has changed, sometimes for the worse and sometimes for the better. I joked a while back that the best thing I did this year was get sober, and the worst thing I did this year was get sober. I did a lot of things for the first time in 2015: drive across the country alone, take sobriety seriously, begin to put myself first instead of others, speak my mind without being afraid of the consequences, become a better comedian, quit smoking and then start smoking and then quit smoking and then start smoking and then quit smoking and then start smoking, and finally rid myself of the shame and stigma of alcoholism. Writing and sharing this blog really helped me and sharing my experiences of sobriety became an unexpected source of therapy. I am still in a constant battle of hating myself and my body, but like the program says, I need to take it one day at a time. A lot of principles found in AA are not just for sobriety, but for life. I am actively trying to work on becoming a better person, and while there are definitely days where I fall short, I end each day with honing in on one thing I did right that day, whether it isn't drinking or simply returning a phone call. I miss my dad. I miss Steve. I want to be someone they can be proud of, because for the last few years, I was someone I wasn't proud of, someone I hated, and I don't want to be that person anymore. My goals for 2016 are to stay sober, find a job I like, and continue on the path of making good decisions for myself. I want to believe these goals are realistic and attainable. I want to be less hard on myself, because if I'm good at one thing, it's criticizing myself, my emotions, and my actions. Breathe, take it easy. Most often those facets are better said than done. I need to remember that I need to work on my progress and not my perfection. But tonight, I can go to sleep knowing I didn't drink today.